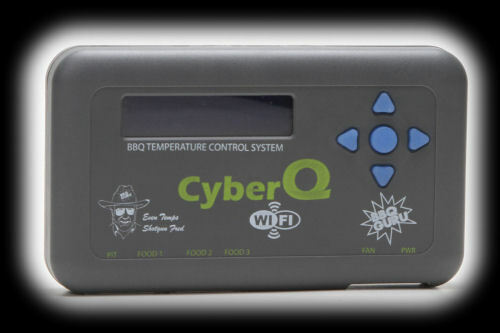 The BBQ Guru's first attempt to add "connectivity" to a barbecue temperature controller was the CyberQ II which featured a USB connection. While internet connectivity and even wireless connectivity was possible, we have to admit it was challenging to get it working in a truly useful way. Well now The BBQ Guru has come out with a truly wireless controller that connects to the internet. so how does the CyberQ Wifi controller work, both as a controller and as a wireless device? A five-key keypad for entry of data and settings. Adjustable backlight and contrast on the display. Blower duty cycle percentage viewable on main screen. Adjustable proportional band to determine when the blower will be full on. A 4, 10 or 25 CFM blower with adjustable damper that controls airflow. Adapters to allow you to attach the CyberQ Wifi to different brands and models of cookers. Built-in wireless hardware and web server lets you upgrade the software from your PC as well as set up and control the CyberQ Wifi anywhere you have Internet access. Automatic scrolling display of all the temperature probes for easy monitoring. Built-in timer with the ability to set one of several actions to be taken when the timer expires. The only other thing you need to order with your unit is a blower and adapter for your particular cooker. We'll show you those later on in the review. In the third photo above, you can see the bottom edge of the system unit where you will find all the connections. From left to right, we see the pit probe socket, three food probe sockets, the blower connector and finally the power connector. As you can see on the front photo of the system unit, these connectors are all labeled on the front of the unit. First the display. It is a 16 character by 2 line backlit LCD display that is easy to read and a pleasant blue color. You can adjust the backlight and contrast settings to make it more easily visible in various lighting conditions. There are five soft rubber buttons for controlling the unit. The up and down arrow buttons are used for scrolling up and down in menus or increasing and descreasing values such as a temperature. They are also used (when pressed together) to enter and exit the setup menu. The left and right arrow buttons are used to select digits when specifying values and for moving between menus. The center round button is used like an enter key to select things, save things and it is also the power button when pressed and held. Some other functions performed with the buttons are pressing the Enter and Up or Down keys together to adjust the screen backlight, and pressing Enter and Left or Right together to adjust the display contrast. And finally, if you press all four arrow buttons together and hold for five seconds, you will reset the CyberQ Wifi to the default factory settings. When you press a button you get a confirmation chirp, but this can be turned off if you like. One final feature of the buttons is that they are illuminated. If you are not connected to the unit via Wifi, the buttons light up constantly. If you do connect via Wifi, they flash as an indicator of data transmission and receipt.